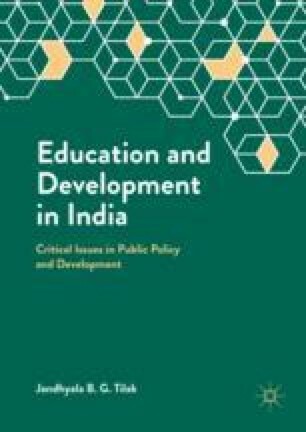 Educational statistics assume greater significance today than ever in view of the structural and systematic changes that are rapidly taking place in the social and economic sectors in India. The chapter reviews the current status of educational statistics, identify and discuss problems relating to educational statistics including their reliability, comparability of data collected by various institutions, gaps in data and the bottlenecks in their timely processing and dissemination, and outline important strategies for streamlining and improving the whole system. Published by Social Statistics Division, Central Statistics Office, Ministry of Statistics and Programme Implementation, Government of India, New Delhi, Feb 2014. http://mospi.nic.in/Mospi_New/upload/Them_Paper_Education.pdf. © Ministry of Statistics and Programme Implementation, Government of India. This chapter is authored jointly with P.R. Panchmukhi and K.K. Biswal. This heavily draws from Tilak and Panchamukhi (2001). Ministry of Human Resource Development. 2008. Report of the Review Committee on Educational Statistics. New Delhi: Government of India. Available at http://www.dise.in/Downloads/Reports&Studies/Sathyam%20Committee%20Report.pdf (Sathyam Committee). National University of Educational Planning and Administration. 2011a. District Information System for Education (DISE). New Delhi. Available at www.dise.in. National University of Educational Planning and Administration. 2011b. Secondary Education Management Information System (SEMIS). New Delhi. Available at www.semisonline.net. National University of Educational Planning and Administration. 2012. Unified District Information System for Education (DISE). New Delhi. Available at www.udise.in. NCERT [National Council of Educational Research and Training]. 2016. Eighth All-India School Education Survey: A Concise Report. New Delhi. http://ncert.nic.in/pdf_files/8th_AISES_Concise_Report.pdf.